China has conducted the first test flight of a new, upgraded version of its J-11 fighter jet. According to Russian media outlets, which cited unnamed Chinese reports, on Wednesday the People’s Liberation Army Air Force conducted the first flight tests of its J-11D fighter aircraft. The plane is an upgraded version of the J-11B fighter jets, which themselves are copies of the Russian-made Sukhoi Su-27. According to the reports, the new J-11D incorporates a number of technologies from China’s J-16 fighter jets. 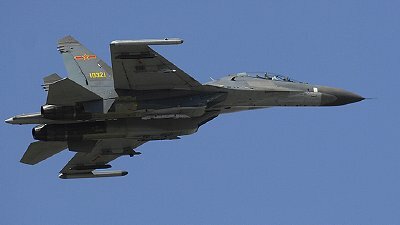 Both planes are manufactured by the Chinese company, Shenyang Aircraft Corp, and the J-16 is believed to have incorporated some technologies from the J-11. However, the J-16 is a multi-role strike fighter. The most important upgrade to the J-16 is an Active Electronically Scanned Array (AESA) radar, which is more powerful than the slotted array radars that the Su-30 and JH-7A have. The AESA radar allows the J-16 to intercept enemy aircraft at longer ranges than either of its predecessors, and to attack multiple surface targets simultaneously. The AESA radar would also be datalinked to other Chinese platforms, including unmanned vehicles, to increase their situational awareness. This AESA upgrade significantly enhances the J-11D’s capabilities over those of its predecessors. In fact, pointing to the AESA upgrades, some analysts have said the new J-11Ds could be China’s version of the Sukhoi Su-35s, which is Russia’s most deadly fighter jet. In fact, some U.S. military officials have told The National Interest the F-15C Eagle and Boeing F/A-18E/F Super Hornet “would both have their hands full” in combat against the Su-35. Besides the AESA radar upgrade, Russia Today reports that the new J-11D uses more composite materials and boasts more air-to-air missiles like the PL-10 and PL-15 than did earlier versions of the plane. It also has a new in-flight refueling arrangement that is similar to the J-15. Also very notable is that according to some sources, the new J-11D is powered by two WS-10A engines, which are indigenous engines. For all its rapid advances, Chinese aerospace companies have continued to struggle to make high-powered engines that are reliable. Below is a YouTube video that purportedly shows the Wednesday maiden test flight of the new J-11D.